The Coveteur-One of my Christmas presents, admittedly thanks to some less than subtle hinting on my part. 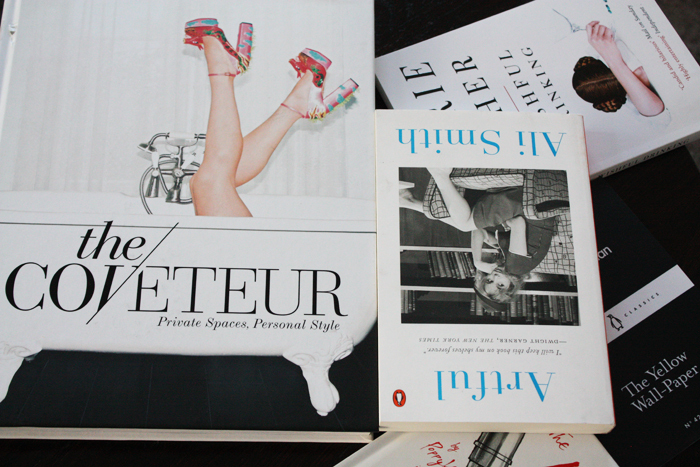 I've been a fan of The Coveteur since 2011, according to these here archives. Crazy thinking it's been that long. Anyway, they released this coffee-table book filled with some of the best of the best homes and possessions from their archives. Tavi Gevinson, Lisa Eldridge and more are included. Even if you have seen these pictures before, it's something else seeing them off a screen and instead on paper. This would make a beautiful gift really and I think anyone with a love for style, design and the stories behind prized possessions would enjoy this. Wishful Drinking by Carrie Fisher-I'd been wanting to read Carrie's books for a while and have now read two in the last couple of months. My only qualm is they are not very long and that there is the painful reality that there won't be any more. Unless of course some are released posthumously. Wishful Drinking is a collection of essays and anecdotes from Carrie about her not so normal upbringing, Star Wars, her experiences with mental illness and more. Yes some of the topics are heavier but Carrie presents them in a way that is relatable and at times pretty darn hilarious. It's so important to be able to find joy in dark times and comedy can be perfect for that. Such a great read. The Yellow Wall Paper by Charlotte Perkins Gilman-A book I bought inspired by Emma. I think we just basically encourage each other's retail habits. Anyway, The Yellow Wall Paper is a collection of short stories, which I have only just realised. Whoops. It is one of those texts that does get referenced and recommended as must-have feminist reading though so I am glad to finally have it. Artful by Ali Smith-The Oxford lectures of Ali Smith, all available in one paper volume. She looks at literature, the consideration of art and life and the significance and importance of literature. It sounds a bit nerdy perhaps. Although if you are a lover of words and appreciate Smith's prose, it will no doubt be required reading.